Enter the Chem Lab, if you dare! Each team spins the “Wheel of Improv”, a mystical wheel on Bill’s iPad that contains more than 40 improv forms. Whatever form the wheel lands on, your team must perform it! (If you don’t know it, Rob gives a quick summary and you do your best, no pressure). MUHAHAHAHA! 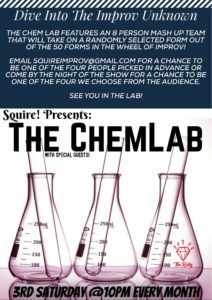 Each month we have one guest team and an 8-person mash-up team made up of anyone in the audience who dares spin the wheel or people who email us beforehand. Want to be a part of the mash-up team? 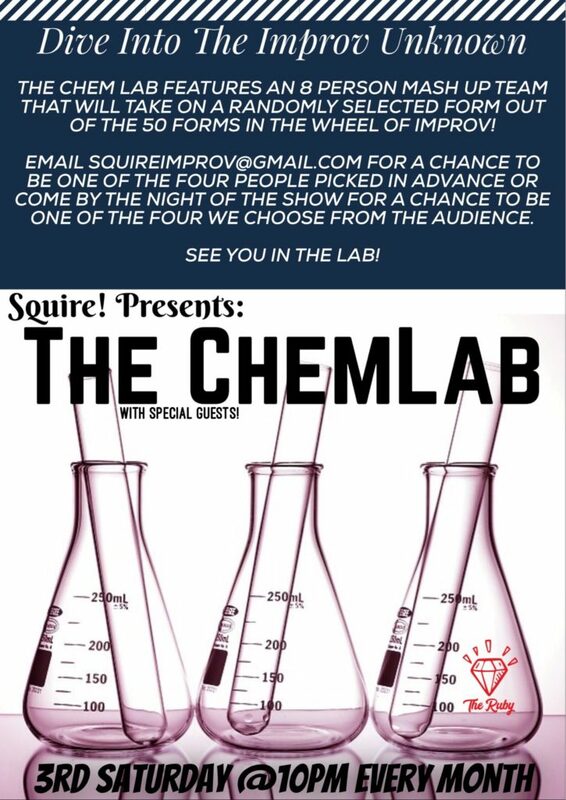 Email squireImprov@gmail.com for a chance to be one of the four people picked in advance, or add your name the night of the show to be one of four people we pick from the audience! Squire is: Bill Castrogiovani, Rob O’Connor, Joel Ugolini, Dan Heber, Shalom Nieva, Clay Prietsch, Raphael Chestang, Brett Herman and Tim Noonan.